As a wise philosopher once said, we are living in a material world. While virtual objects are great, there’s something amazing about being able to hold something in your hand – like how an image on your computer can disappear in a flash, but a physical photograph is unique and permanent. Today, we’re going to show you how to bring your Sculpting creations to life with the power of 3D printing, from bits to atoms in five easy steps. Create your object. Free for Mac and Windows in the Airspace Store, Sculpting is a powerful creative tool that lets you sculpt clay in the air. You can explore alternative materials such as glass and plastic, reach into a wide variety of sculpting tools, and even paint your creation. At the top of this post is a cup that we created in Sculpting. Customize your creation. You have the option to add several cool effects, including text, images, and new colors. You can also add a cubify filter that makes your object look pixelated. Choose the material. Sculpteo gives you the option of printing your object in plastic, resin, silver, ceramic, wax, and alumide. You can read about each material’s texture, strength, and other properties on Sculpteo’s materials page. While Sculpteo offers beautiful glossy ceramics in one color, we decided to take the multicolor option for our cup. Adjust the scale. The larger your object is, the more it will cost. 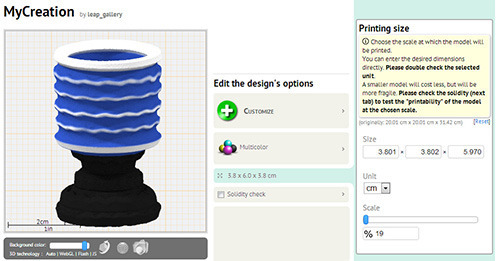 You can precisely control the size of your object in Sculpteo before ordering. Once you complete and confirm your order, Sculpteo will ship your creation to you. You can create almost anything with Sculpting and Sculpteo – from custom jewelry and figurines to special keepsakes. What will you create? Tweet us @LeapMotion with the hashtag #printmyleap, post on our Facebook page, or join the conversation on our forum. Next PostWhere Will Motion Control Live in the Smart Environments of the Future?